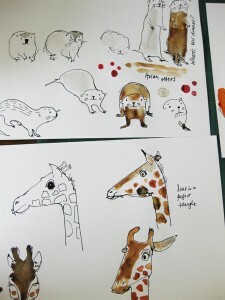 I’ve finally had a chance to do some drawing following my day as zookeeper for a day at Whipsnade Zoo a month ago. This is the starting point for my show ‘Compendium’, at The Old Sweet Shop in October. Now I need to develop the drawings into ideas about games and playing. 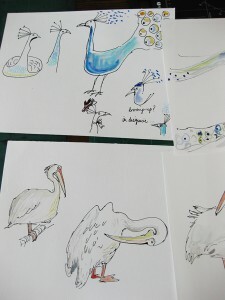 This entry was posted in animals, birds, Exhibitions, Illustration, sketchbook on July 13, 2009 by Jane Porter. love these sketches! especially the little curious fellow in the bottom right corner. so cute. happy drawing! 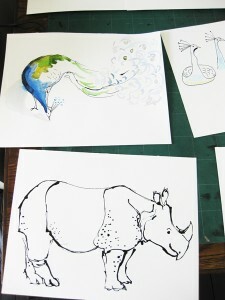 I love your animal drawings especially! 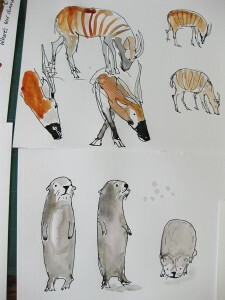 I really love the grey ones at the bottom corner too, are they otters? They are so sweet! It was a pleasure to meet you at the plinth too! I will defo keep an eye on what you’re up to and good luck with the rest of your prep for october! It sounds really interesting.